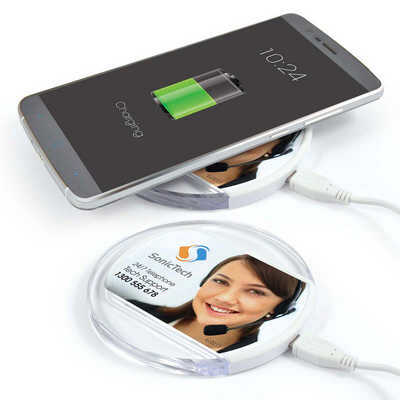 Inductive, wireless charge pad compatible with phones that offer wireless charging. Features white centre with clear surround and anti slip ring. Features blue LED charge indicator that flashes when charging. Suitable for Apple 8, 8 Plus X, XS, XSMax and suitable for Samsung Galaxy S6, S7, S8, S9. Connect charging pad to power using micro USB cable provided then place your phone on the charging pad to charge. Instructions included. Please check your phones compatibility for wireless charging. QI compatible and manufactured to QI standards. Colours - White Size - 100mmDia x 10mmH Decoration Area(s) - Pad Print : 60 x 50mm (LxH); 4CP Standard Label on Box : Circle - 90mmDiameter; 4CP Digital Direct : 80 x 53mm (LxH). Price includes : 1 Col 1 Pos Print. Setup is included.